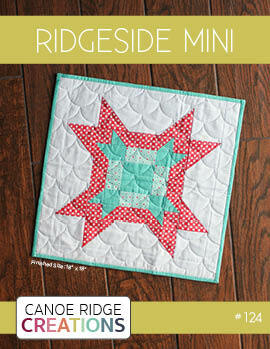 Canoe Ridge Creations: DS picnic + fairgrounds quilt. DS picnic + fairgrounds quilt. hello, friends! i hope you are all having a fantastic weekend! it's hard to believe we are almost a full week into August, phew! remember when i mentioned last week that i was able to sneak a bit of sewing in at the lake? well here's the first finished project -- my DS picnic + fairgrounds quilt. i started this quilt over a year ago, right after Denyse Schmidt released her first two fabric lines with Joann Fabrics. these fabrics make my heart sing, especially paired with Robert Kaufman Kona White! something about them reminds me of my grandma + life on the farm. which is why i gifted a mini quilt version to her for Christmas last year -- and i'm happy to report she uses the mini quilt everyday! 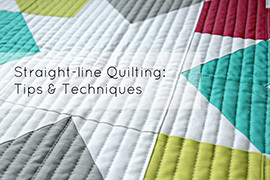 the quilt pattern comes from the Spring 2011 issue of American Patchwork and Quilting: Top Ten Quilt Stores. 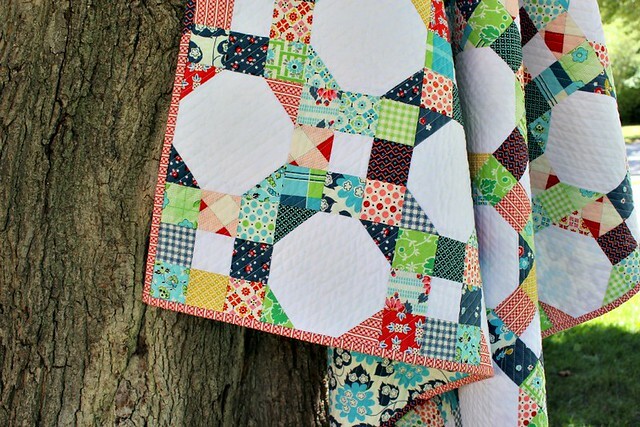 i especially love how the traditional feel of the fabrics + colors compliments the overall quilt design. finishing up at 54" x 54", it's the perfect picnic quilt size and i'm really looking forward to using it this summer! 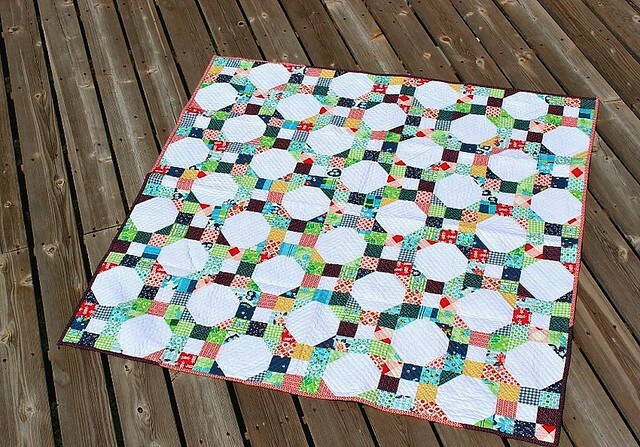 this quilt was entirely pieced + quilted using my favorite Aurifil thread, 50wt in white. seriously.love.this.thread. using my walking foot, i quilted a big "X" in the center of the quilt and echoed the lines out every 1/4" making for some fabulous quilted texture. 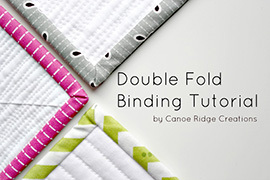 that's the same quilting technique i used on my grandma's mini quilt! name: DS picnic + fairgrounds quilt. What a gorgeous qui.t! I was just looking any stack of DS Joann lines and wondering what to do.. This is a great fit for these fabrics. I love it! The fabric, the design and the quilting all work very well together. I love those fabrics! You've done a beautiful job, the quilt is just lovely! I'm not much of a DS fan (heresy! ), but they do look wonderful in that quilt! I really like that pattern a lot--thanks for sharing the source. You're right that it's just perfect for fabrics that are a bit retro feeling. 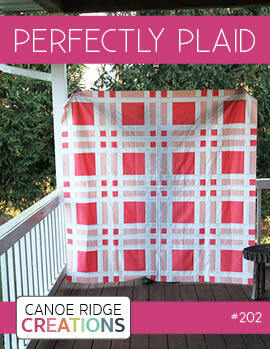 Fabulous choice of quilt pattern for this modern/traditional fabric! 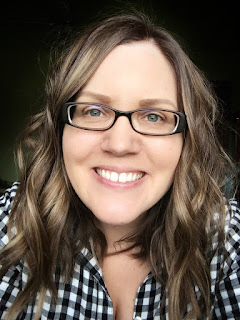 I love Aurifil, too!! Beautiful quilt, Megan! The fabrics from the two collections coordinate perfectly together. Love the scrappy binding too! Beautiful quilt, Megan! 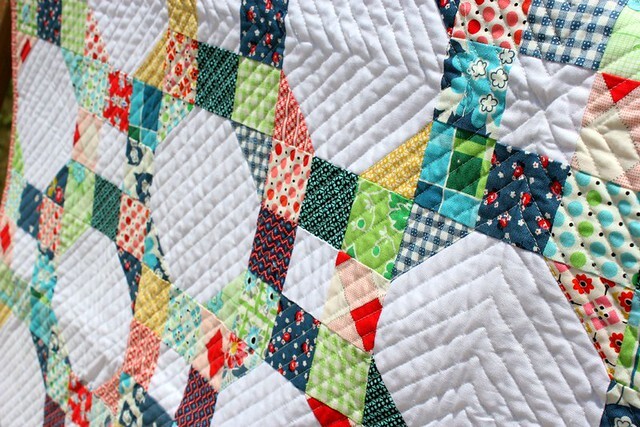 I love the way you quilted it! I LOVE your quilting on this, just perfect. The quilting is fab. It's such a great quilt!!! This is beautiful and I love the way you have quilted it. love love LOVE it! 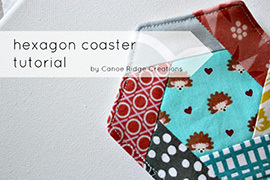 Such a fantastic design for those fabrics, and your quilting is brilliant! It. Is. Awesome! Major props to you on the quilting - I just can't do any closer than 1" (i go insane!) Beautiful. this is beautiful!! 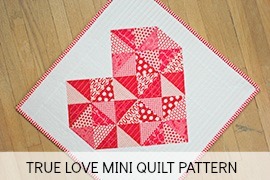 Love your quilting with the BIG X and echo! That is beautiful! 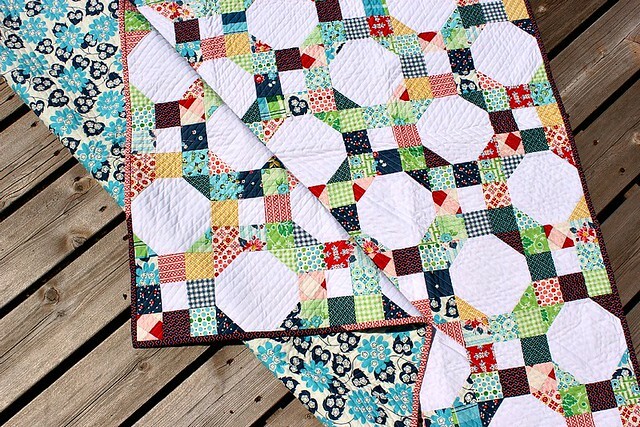 I love the way the fabrics look together like that and the quilting is wonderful! 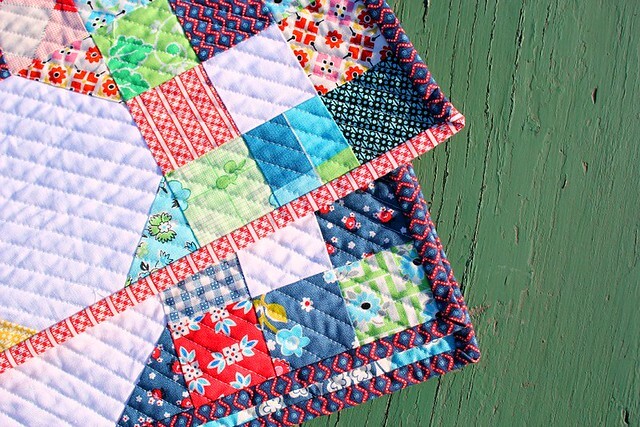 Beautiful quilt and I love the quilting you did too! This is really awesome Megan! The quilting really looks incredible. Great quilt Megan! Love the pattern with those prints. 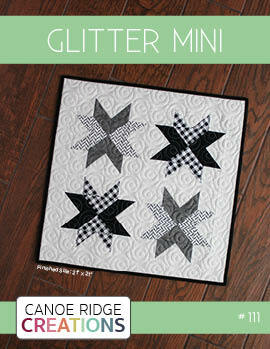 I'm thinking of using that X quilting pattern on my next quilt that needs quilted! what a gorgeous quilt!!!! So, so pretty! I love the quilting on it! It is wonderful, and I am marveling that you could start in the center and your quilting lines seem to still be accurately bisecting triangles at the outside edges. Nice!! Just lovely in those DS fabrics. I looked this up on your blog again because I'm looking for a quilt pattern to make for my dad's 70 bday this summer. I have a Fat Eighth bundle of Happy Go Lucky but have had a hard time finding FE friendly patterns. 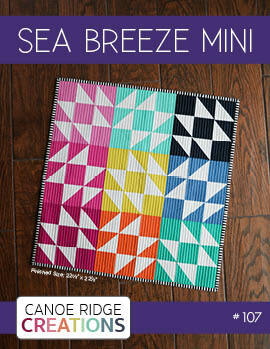 It turns out that I saved this pattern from my Quilt Sampler issue that year! It calls for FE's! Thank you so much for making and sharing this quilt. I've always loved it. help! I'm trying to find this pattern or at least a picture of it in the magazine online and can't seem to find it. I've been searching the link you provided above to no avail. I LOVE the quilt and would love to create something like it. Can you point me to the pattern? Or give me the pattern name? I have the same problem as Joyce above me. I clicked on the link but it doesn't take you directly to the pattern. 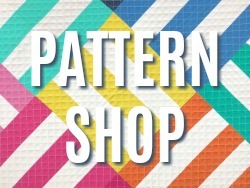 I am unsure if the site has the links to the Top Ten Store patterns. Could you give us the name of the pattern and which store shared it in that particular issue?